I took most of this week off to catch-up with stuff around the house and the garden. It was the first week of the school holidays in Dundee so a great time to be on leave. I still haven’t got over the feeling, from my time as a teacher, that the first week in July is the start of the summer. 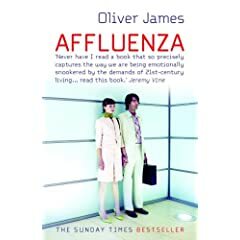 I associate the school summer holidays with reading and have just finished Oliver James’ ‘Affluenza’. It is a good read and makes a lot of sense but left me thinking that there was not much that he had to say that I didn’t already know. His basic premise is that we have become infected to a greater or lesser extent with what he calls a ‘virus’ that makes us confuse needs with wants. As a psychologist he goes on to claim that the values of what he calls ‘selfish capitalism’ are closely associated with growing levels of ’emotional distress’: ‘the extent to which a developed nation is Selfish Capitalist and infected by Influenza is crucial to the well-being of its inhabitants’. He makes a lot of the importance of early learning, parental bonding (drawing on attachment theory) and the importance of ‘being’ over ‘having’ as vaccines against the virus. All sounds like pretty good sense to me. Next step, use the rest of the Summer to educate my children (not brainwash them) so that they only consume what they need (not what the advertisers want them to want)! What do you think my chances are? I suspect your chances are pretty low Laurie! 😉 That’s the problem with living in a society who’s primary driving force is selfish capitalism. James most recent book ‘The Selfish Capitalist’ teases out his theory much further in light of the criticism he received for Affluenza. I’ve recently finished ‘Philip Ball – Critical Mass’, and ‘Clay Shirky – Here Comes Everybody’ which I’d highly recommend to add to your reading list (if War and Peace gets too much!). I know you are right but it’s always worth the effort. When I was a child I remember my grandparents (and later on my dad) saying that they didn’t need anything for Christmas and wondering at the time what they meant. It’s funny but I really understood what they meant over the last couple of years. I will get a hold of James’ other book and your other recommendations to add to my pile – thanks.